The closer we get to Spring on the calendar, the farther away it seems in some parts of the country. It is my Dad’s birthday today, and in his part of the country kids are walking outside in their shorts, while in Toronto we are weathering yet another winter storm. Such is life in Canada’s largest city. 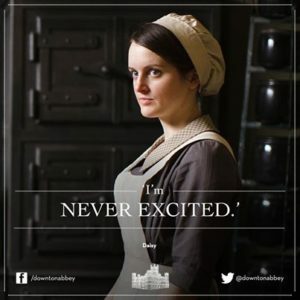 On the plus side, Downton Abbey fans are happy to have a bit of Downton here for a visit. Today‘s dish is a catch up recipe from Season 4. Peach Melba is a classic and simple dessert made of poached peaches, raspberry puree, and served on vanilla ice cream. 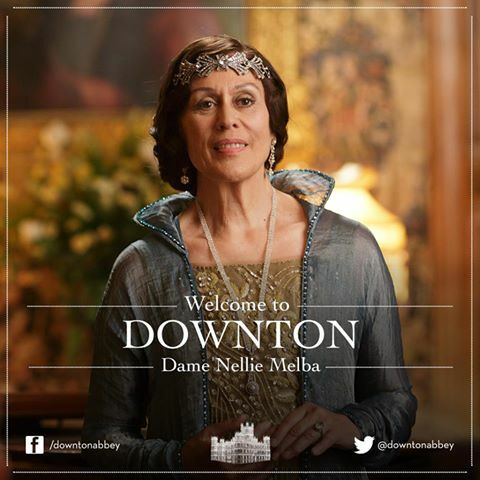 On the other end of the scale, Melba toast is also named in her honor. Dieters are familiar with the thin baked toast, created for the opera singer to help when she gained weight later in her career. Canadians can look forward to Season 4 on Vision TV on Wednesday nights, with a change to Watch and Win. Read about Unsung Downton Characters: Isis finally has some time in the spotlight. Play Downton meets Harry Potter, downstairs: What would the Sorting Hat say about downstairs. Play Downton meets Harry Potter, upstairs: Which house would the Sorting Hat place the aristocrats? 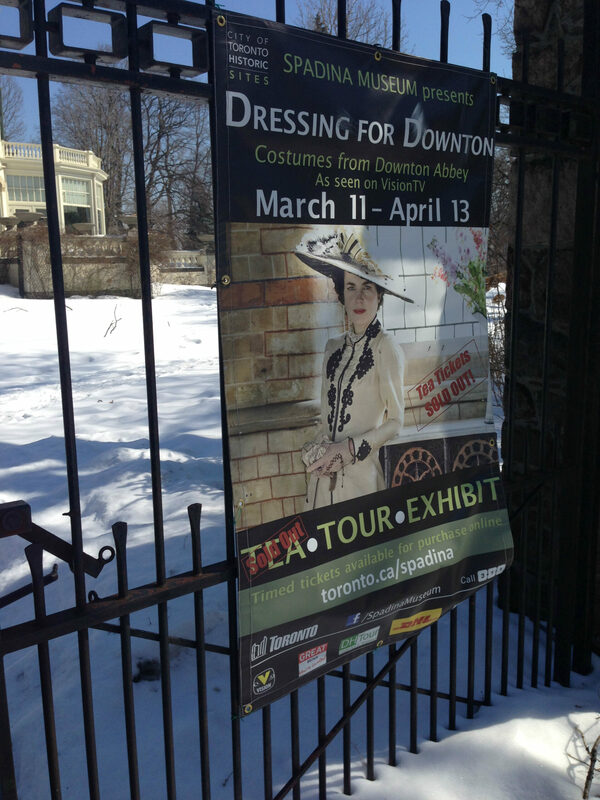 With the bleary weather we have been experiencing this winter in Toronto, the opening of the special Downton Abbey costume exhibit is a breath of fresh air. 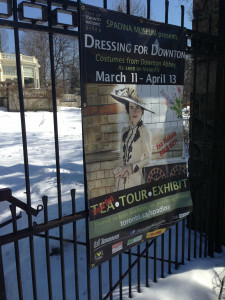 The show ran in Toronto from March 11 – April 13 at the Spadina House. This is a century old home, perfect to house the twenty costumes that will be the only stop in Canada. 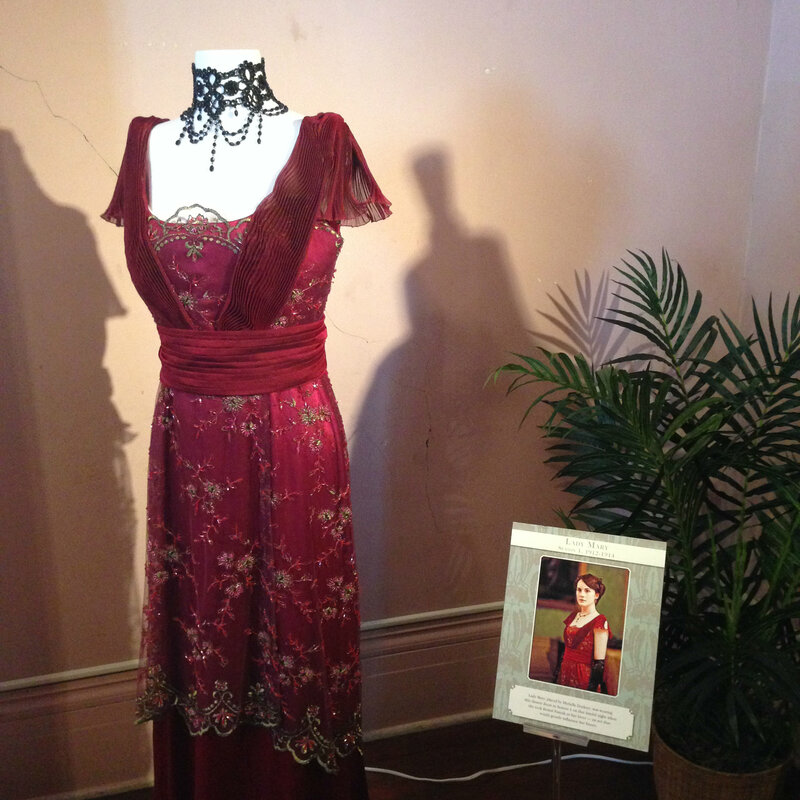 I was privileged to have been invited to the advanced press briefing to be one of the first to see the costumes up close, and to explore the grand rooms of the Spadina House. And for those of you follow the antics of our infamous mayor, Rob Ford, yes, he was there. Black shirt, red tie, and cowboy boots. The Dowager would have been so proud. Before we went in, a journalist asked about my expectations. My first thought was panic that I wouldn’t be able to recognize the costumes from the episodes, but all the costumes are very memorable pieces. 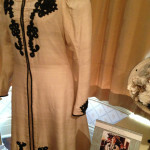 My favorite Cora costume from the Flower Show was the first I noticed. Another, Mary’s striking red dress with black choker, was also on display. Once you have seen the lovely pieces, you get a better appreciation for just how diminutive the actors are. 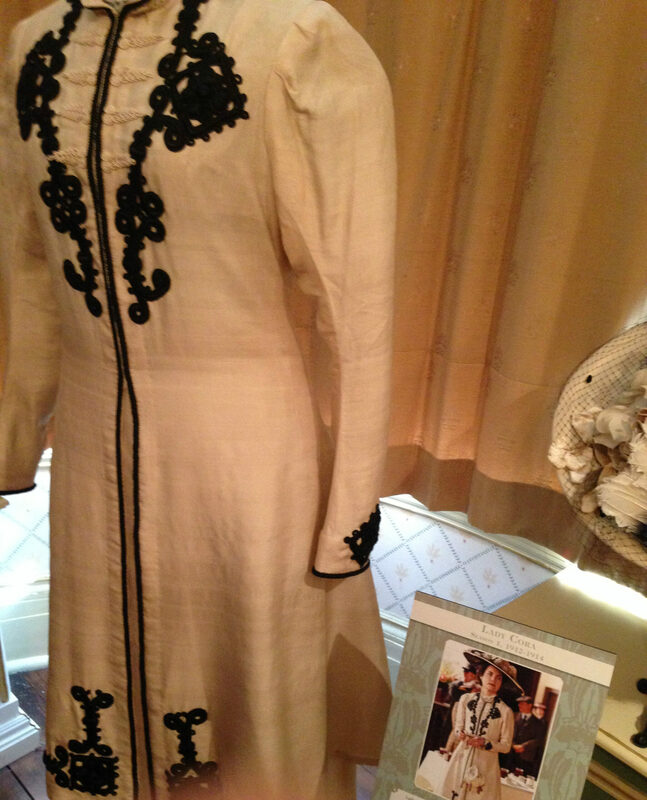 I don’t think I could ever fit into any of the lovely dresses (well maybe Dowager and Martha). As one reporter quipped, “I could fit this costume as far as my arm!” The same goes for the men as well. Lord D posed next to his favorite Robert outfit from the Garden Party at the end of Season 1, as well as a classic Matthew ensemble. I always said actors have to be small to fit into those small screens! 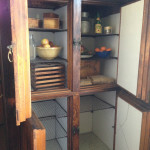 When we finished viewing the exhibit, Lord D and I found our way down to the kitchens in the Spadina House. My guess is that they might have had a Mrs. Patmore running their kitchen as they continued to use their huge icebox until the 1940’s after ice delivery was no longer a viable business. All in all, I give this a two Carson eyebrows up for Downton fans. Perhaps not the same as a day by the beach, but worth the travel back in history. The exhibit will not be available anywhere else in Canada, and only one other spot in the US, so you shouldn’t miss this opportunity.